Every fireworks show at Magic Kingdom is spectacular, but there’s always been something special about the Wishes Nighttime Spectacular. The show really immerses guests in an entire story that will stick with you long after you leave the park. There’s nothing quite like it and with so many unique viewing locations, you can experience the show in a new and different way each and every time. While everyone loves to watch Wishes from that iconic Main Street U.S.A. location, there are many wonderful areas that offer a completely different experience centered around that same outstanding nighttime spectacular. While there’s nothing wrong with Main Street, and I recommend that everyone view the fireworks from there at least once, here are just a few of the many unique places to see the Wishes Nighttime Spectacular at Magic Kingdom! As you prepare for the experience, grab some food and make sure you have a pretty clear view of the castle as well as a glimpse of New Fantasyland to your left. As the show begins, its hard to expect what this spot brings to the table. (Warning: It is not the best viewing location for children who are easily frightened by loud noises.) The fireworks surround you throughout the entire show due to the way Disney has created the sequence of the fireworks. Up by the castle, fireworks are launched off of the buildings that create the smaller effects within the presentation. However, the noise these fireworks create within such a close proximity is pretty amazing to witness. Also, you get to experience the show from a vantage point that is often overlooked, and of course what’s better than dinner with a show? Close to the Village Haus is another interesting opportunity that debuted just a short while ago when New Fantasyland opened to guests. Right now, this is one of those hidden spots that very few recognize to be a great location to experience Wishes. While you will not get the classic view right down the middle of Main Street U.S.A., you do in fact get a view of fireworks towering over Beasts castle! The trick to this location is to be in the right place at the right time. You won't have to stake out the spot because very few notice it unless they have witnessed it first hand, but it's a very unique experience. To get there, make your way out beyond the Carrousel, and look for the Seven Dwarfs Mine Train on your right. As you approach the portion of New Fantasyland where the drop from the mine train is visible, look to your left at Beast’s castle up on the hill in the distance. If you see the entrance to Enchanted Tales with Belle on your left, you’re in the right place. This one may surprise a few people. While technically not in the Magic Kingdom, after a long day at the park this is one of the more unique ways to experience the show. 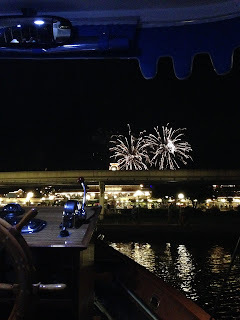 Unfortunately (or fortunately, depending on how you look at it) Disney has picked up on this one and are now offering fireworks dessert cruises with a variety of themes. 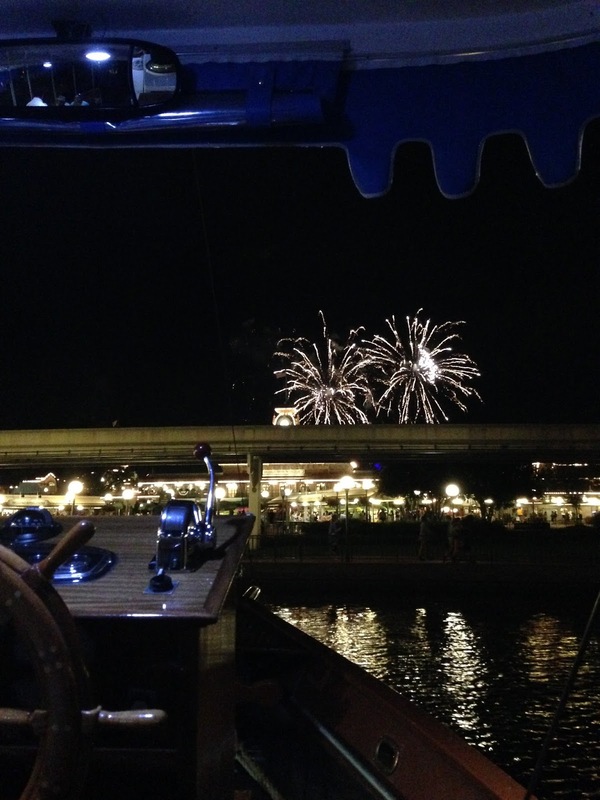 While those experiences are great, you don't necessarily have to shell out the big bucks to view Wishes from the water. -The PeopleMover and Splash Mountain: While I decided to leave these two out because they are incredibly difficult to anticipate and you really only get short glimpses of the fireworks, some of the most unique views in the parks come from rides on these two iconic attractions. On Splash Mountain in particular, if you can manage to time your ride or fastpass+ selection with the time of the fireworks you can experience a great view that you can’t experience anywhere else. As you top the mountain beginning your journey, look towards the castle and back behind it to see the fireworks at almost eye level. Also, as you top the final hill you get an even better view of the fireworks in the distance, no matter how short of a glimpse that may be. The PeopleMover (or Tomorrowland Transit Authority) is a bit different. While the attraction is usually a walk on, its hard to time your ride to get the best possible views of the fireworks themselves. However, you get to experience something unique. You get to see all the people from above and for even just a brief few seconds you get to witness all of those guests amazed by what they are experiencing. It’s one of those things that you can't experience in a crowd of people, but from above, the scale of what’s going on around you is hard to overlook, yet great to experience first hand. There’s something magical about seeing the park at night. Everything is different, but in a good way. It’s an experience that you don't get anywhere else and hopefully these unique places to watch the Wishes Nighttime Spectacular will create even more of those unique opportunities on your next visit to Walt Disney World. Of course, there are many more locations, so be sure to let us know what your favorite place to watch the fireworks is! Thanks for reading and if this gave you any new ideas or was something you enjoyed reading be sure to share it with friends! @guide4disney is almost 3,000 strong on twitter and we’re thrilled to have each and every one of you following along with us!